If receiving sound during call is not heard clearly or broken irregularly, firstly please check whether you attach Samsung-unapproved protect accessories covering perfectly all parts on Galaxy Note8 device’s back. 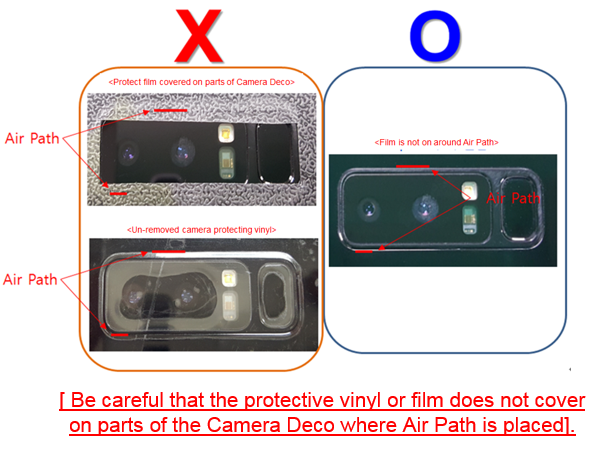 Some of Samsung-unapproved protect accessories like films, covers, vinyl which attach on device back side cover even Camera, Flash, HRM sensor and this causes to block the Air Path(Air vent hole) inside the device. Due to blocking of Air Path(Air vent hole), receiving sound is not heard clearly or broken irregularly, and volume may be also low. 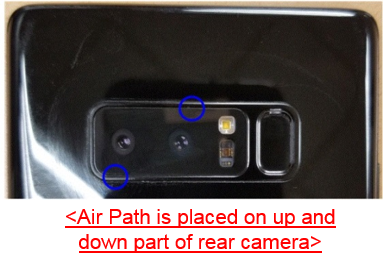 Please keep in mind not to use Samsung-unapproved protect accessories covering Camera, Flash, HRM sensor. Especially, as this symptom can also appear when protect vinyl or film cover on a little bit of Camera Deco, be careful that the protective vinyl or film does not cover on any parts of the Camera Deco. Additionally, please check whether or not protect film covers Mic. hole if call volume is low/muted or Mic. Audio quality is poor. Also, if the device has been immersed in water or speaker is wet, sound may not be heard clearly during a call because water may get in the speaker hole during exposure underwater. If upper phenomenon happens or the device gets wet after getting out the water, firstly please wipe device smoothly with a dry, soft cloth and keep putting during certain period of time to dry it thoroughly before using device. Additionally for faster drying of water from speaker, it will help that you hold the device while speaker of device is facing down and shake device smoothly a few times to remove remaining water. Despite this, when some moisture remains on Mesh in front speaker, sound may not be still heard clearly. At this time, as this moisture can be also removed by speaker vibration during call, please check the device’s sound state while making call for a period of time. If you are still having trouble with the sound after trying these tips, please visit any Samsung Service Center with device. [Galaxy Note] How to copy contacts from the device to the SIM card?